What is Plantar Fasciitis? What about Heel Spurs and Heel Pain? Haglund's Syndrome? What about Haglund's Deformity? The Heel and Arch Pain Clinic in Newcastle is owned and operated by Danielle Robertson, a podiatrist with 21 years experience in private practice. 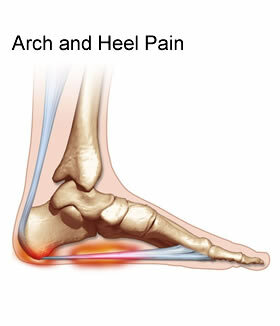 The clinic offers the latest advancements in the treatment of heel and arch pain. There are three convenient locations at Waratah, Edgeworth and Warners Bay, each with level access and easy parking. The Heel and Arch Pain Clinic is affiliated with Beyond Podiatry and The Bunion Clinic which are also located at the above locations. Our podiatrists have extensive knowledge and expertise in treating heel and arch pain and are registered with the Australian Podiatry Board. At the Heel and Arch Pain Clinic we strive to give the best patient care possible, and we are approachable regarding any foot pain you may have.